PAR.I.S. is a small separatist Sardinian party, basically a private project of its leader, Salvatore Meloni. 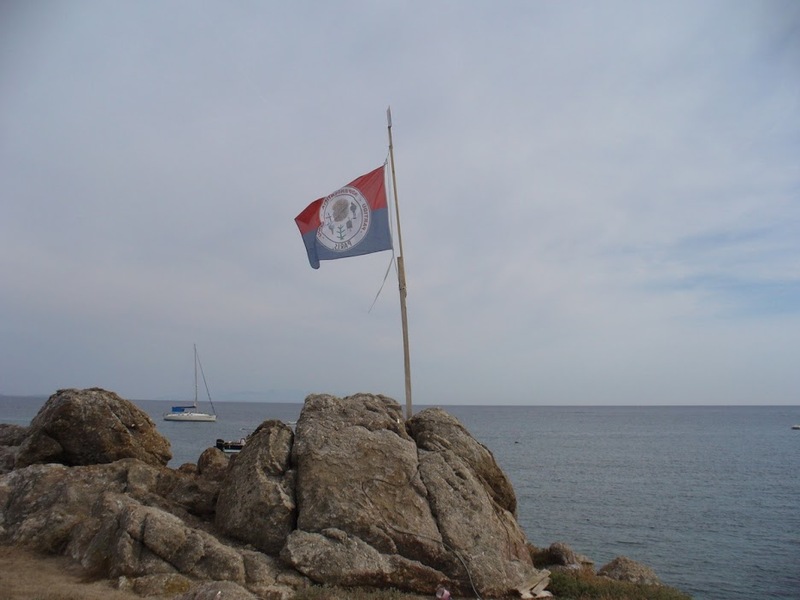 It became somewhat better known, when Meloni in 2008 declared the independence of a small island on the Sardinian west coast, Malu Entu (Mal di Ventre = Stomach Ache) and hoisted the flag of the "Repubblica Malu Entu" [1,2]. The symbol combines several items from the ancient Nuragic civilization (Pintadera disk and bronze figurines) with a crude depiction of the eradicated tree of Arborea; the party name and abbreviation surrounds all that. The flag is red over blue with the symbol [3,4]. The symbol and flag of the self-declared independent republic is the same, except for the inscription "Repubblica Malu Entu" instead of the party name [5,6]. The island of Mal di Ventre (lit., "Stomach Ache"; area, 80 ha, maximum elevation, 18 m asl) is located off the town of Cabras, on the western coast of Sardinia. See the "Sardinia Tourism" website for a complete description of the island, protected today by the Protected Marine Area Authority. "The curiously named Mal di Ventre, which means 'Stomach Ache' in Italian, was declared independent last month by a secessionist movement led by veteran activist Salvatore Meloni, who proclaimed himself president. He set up an official presidential "residence"  a blue plastic tent pitched on a pristine beach with the address No 1, Seafront  and named his fiefdom the Autonomous Republic of Mal Entu  the Sardinian dialect name for the island. Militants from a far-right political group which staunchly opposes Sardinian independence mounted a raid on the island this week, planting the red, white and green Italian tricolour in its sandy soil. The island's separatists say they are determined not to be provoked by their opponents. "We intend to ignore this act," Mr Meloni, 65, who earns a living as a truck driver, told La Repubblica. "In fact from today we'll draw new strength to continue the battle." The Italian flag would not be torn down. "It will become the symbol of all those scoundrel countries which trample on the basic rights of their people," said Mr Meloni. He said he would surround the flag with a tangle of barbed wire to symbolise the repression of secessionist movements around the world. The battle of the banners is the latest saga in Sardinia's long running campaign for greater autonomy from Rome. [...]"
In "La Vanguardia", María-Paz López relates the same story and gives more details on Salvatore Meloni. 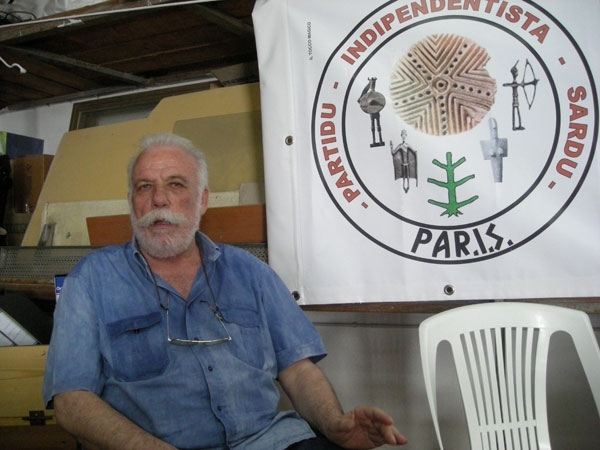 Meloni is a long-time Sardinian independentist, who spent nine years in jail in the 1980s for "conspiration against the state"; he founded a few weeks beofre the proclamation of "independence" a political party called PARIS, the merging of small independentist parties. Meloni backs his claims on the weird legal situation of the island. In 1972, its owner, the English Lord Rex Miller decided to sold it, because wind and enviromnemnt protection laws prevented him to develop a tourists resort on the island. The price was one million euros but the autonomous region of Sardinia never managed to make the purchase. Accordingly, Meloni claims that the island has ben belonging to the Sardinians since 1974 as a sacred area to be protected. He considers that the occupation of Mal di Ventre is the first step towards the independence of Sardina. (See also the grounds and fleet of the Republic on the next photograph and see also the YouTube interview of President "Doffore" Meloni on TV, with the PARIS flag fluttering in the background (on the same rocks as above). The emblem of the party includes six elements of the Sardinian heritage. The four statuettes must be "bronzettos" characteristic of the Nuragic civilization. The mysterious Nuragic people have built all over Sardinia, before 1,000 BC, truncated conical towers called "nuraghe", used today as the symbol of the Sardinian culture and heritage. See Wikipedia. The name of the party is written in red capital letters in the ring surrounding of the emblem : - PARTIDU - INDIPENDENTISTA - SARDU. The acronym of the party is written in black capital letters. The emblem of the party is available on the Politica Online forum. The Independent Republic of Malu Entu (Repubrica Indipendenti de Malu Entu, Repubblica Indipendente di Malu Entu) - It starts, quite comically, as the Piedmontese colonizers mistranlated the Sardu phrase 'Malu Entu' (which means 'Bad Winds') into Italian 'Mal di Ventre' (which stands for 'Sore Stomach' or 'Stomach Pain') some 150 years ago. It was supposed to be the first step in regaining the independence of all of Sardinia. Meloni, and all the early citizens of the republic, got promptly arrested and Meloni spent 9 years in jail for yearning to be a free Sardinian. Last year, the republic was reactivated, flag raised and independence re-proclaimed. There was an attempt to raise money to buy the island from the willing-to-sell English owner, but in February 2009, the Italian military raided the island and thorn down the flag of the republic. In the picture, there is "the president", he ask to Italian Government and UN to make this new State. They have a coin and the presidential palace is a tent for camping on the beach!!! !